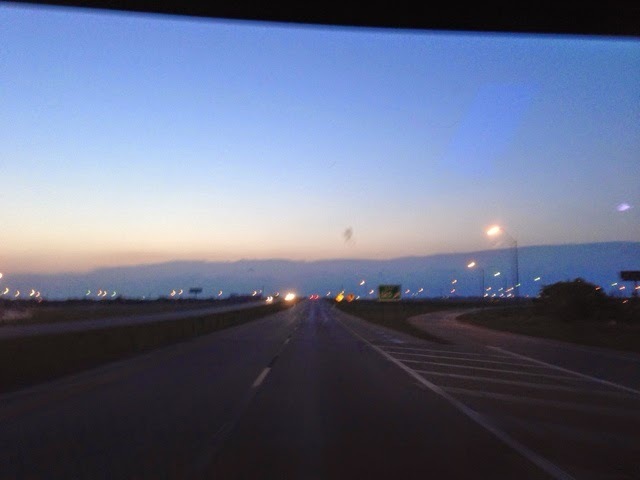 I was on the road early as usual leaving the Casino parking lot headed east toward Oklahoma City, about 30 miles to the east. In the picture above you can see the line if clouds from the rain that passed over me last night with thunder storms. I stopped northeast of Oklahoma City at a truck stop for a shower and a visit to McDonalds down the street to load up on podcasts for my long trip today. Just outside of Oklahoma City on the way to Tulsa I44 turns into a toll road so I decided to take Old Route 66 whiched proved more interesting. 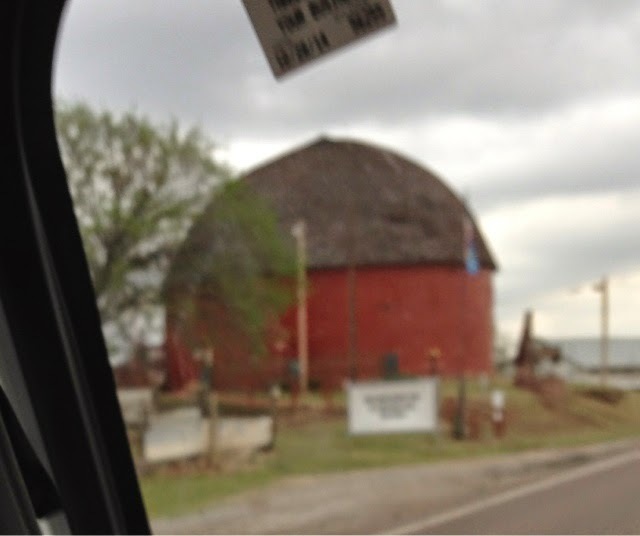 Here is the famous round barn. Unlike the round barbs in Vermont that are octagons this appears round. 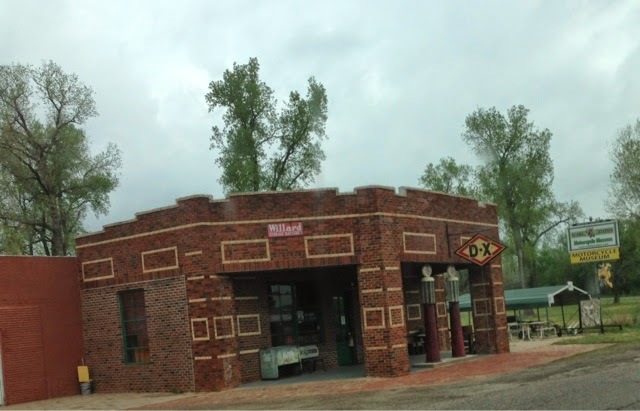 Here is an old gas station that is now a motorcycle museum. In this section of RT66 there are a number of quaint towns with interesting vintage RT66 buildings. This route took me longer to drive although many of the 2-lane roads outside of town are 65 MPH. The road is not as straight as the highway. 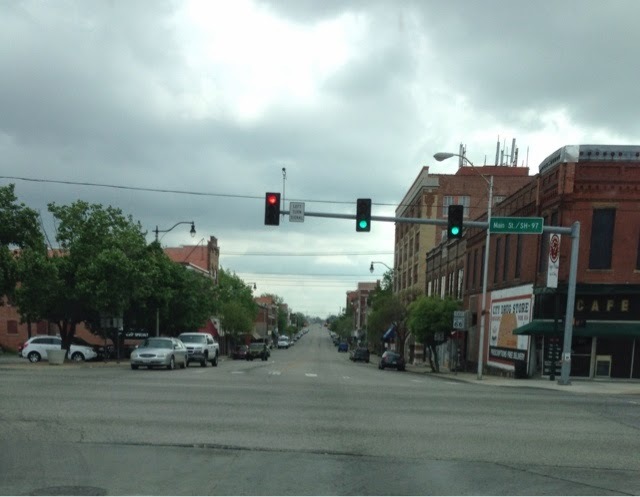 I tried the same old Route 66 from Tulsa to Missouri but the senery was not as good and very few landmarks. 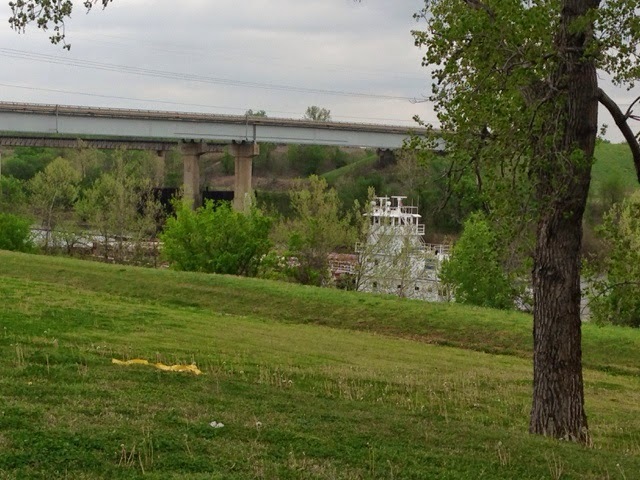 Here I stopped at a park where the old metal bridge parts were that were replaced by this concrete bridge reside and this bardge came by on the river below. After miles of not much to see on the old RT 66 I did got on the I44 turnpike for the last 20 miles to Missouri where I paid $.75 for the use of the road. Just outside of Joplin, MO I stopped again for gas and headed east towards St. Louis, MO. 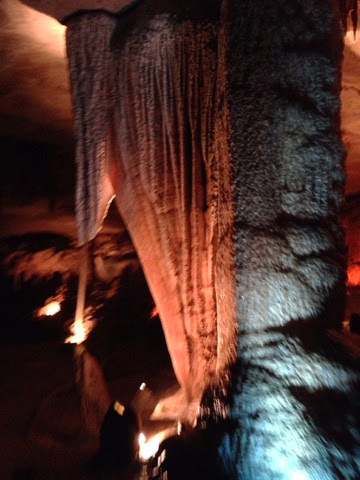 When I got to Springfield, MO I followed the billboard signs for Fantastic Caverns. 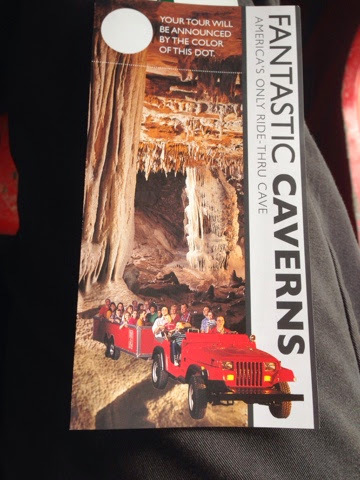 Having been to other caves on this trip I thought it would be good to check these out that youvtake a vehicle into. I also needed a break from the road. 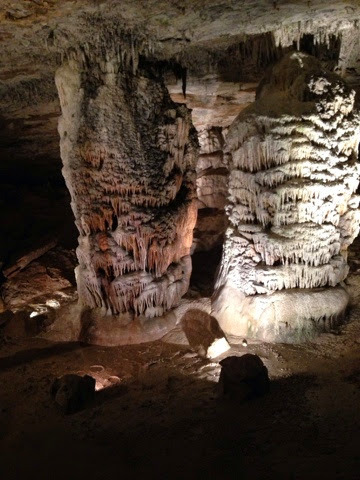 As with the other caves I have been to, these also proved interesting. 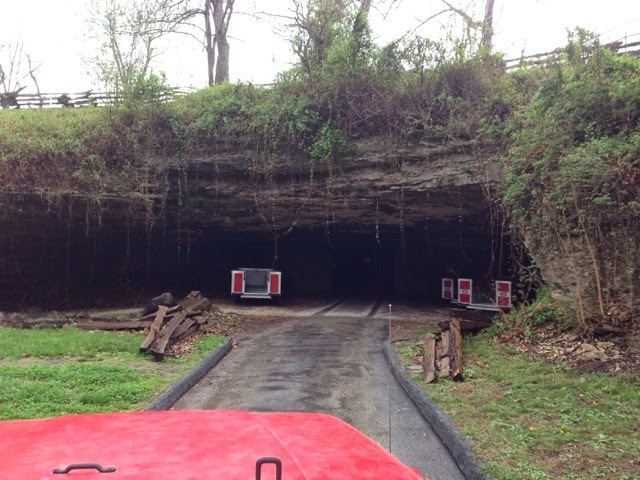 Here is the red nose if the jeep I am in as we drive into the cave. 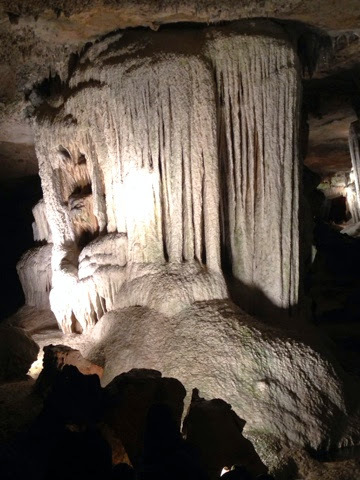 Once inside there are many formations. 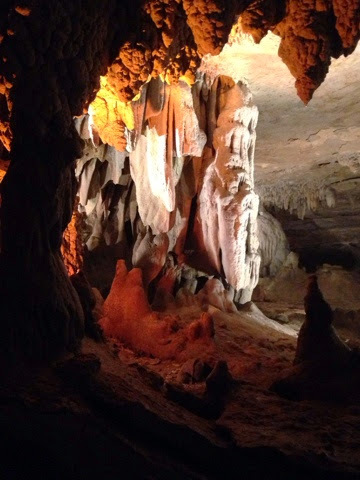 Back in the 1800's when the cave was discovered the owner sought out people to explore it for him. A group of woman took him up on his request. 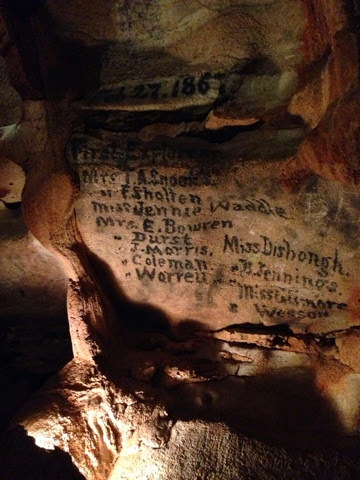 They inscribed their names here. During proabition music and drinking parties were held here. 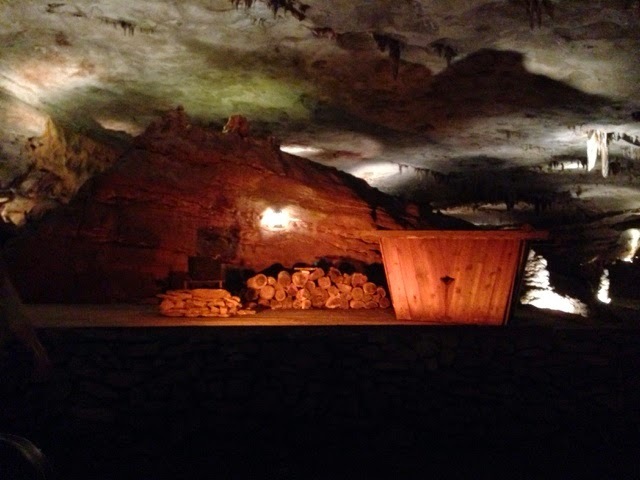 This is a stage inside this cavern. Later in the 1950's & 1960's bands used to play here. 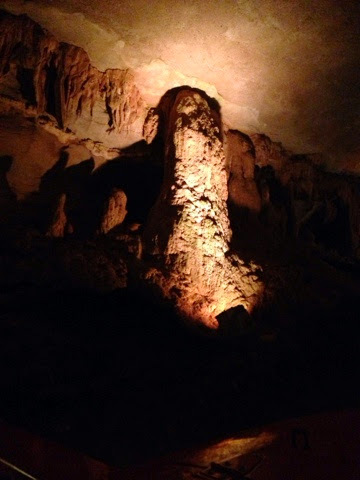 There were many nice formations. After leaving Springfield I drove 2 hours towards St. Louis befor stopping for the night at a truck stop and dinner at Denny's there. This last part of the trip was already at the end of a long day but that weather front off in the distance this morning had been crossed and I was in rain for the 2 hours. 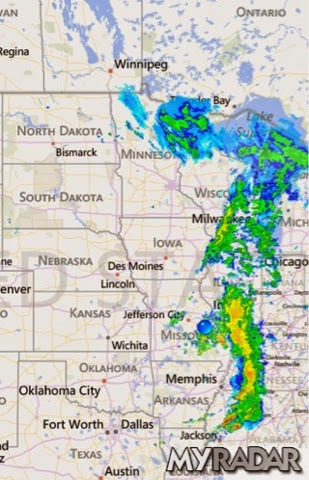 The rain will pass overnight.